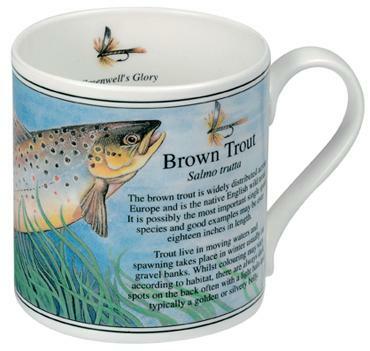 Brown Trout Bone China Mug . The Rabbit (Oryctolagus cuniculus) is our most familiar wild animal being common in most terrains from sea level to the mountains living in warrens of interconnecting tunnels. Breeding takes place mainly between January and June and a Doe will produce about ten live young a year. Rabbits emerge from their burrows to feed at dawn and dusk, eating a pound or more of fresh green food a day and can cause much damage to crops and pasture land. Measuring about 16 inches and with a weight of 3-4 lbs, most wild Rabbits have a grey-brown coat with white belly and a short upturned tail.